Samuel Pace continued to excel in both fine and martial arts. After mastering the art of karate, Sam moved to Europe and began the journey to pursue his dreams of mastering fine arts. During his extended stay in Europe, he developed an immense love for jazz. The art and jazz scenes quickly became his passion and these two loves inspired the now famous series of works entitled “Jazz and Blue”. The critically renowned series created with mixed media, using a variety of paints, were essential to capture the essence of musicians “jamming” and people dancing. Sam wanted the world to see the beautiful scenes that appear in his mind as he listens to Jazz music. The exhibit will be on view to the public, November 12th through December 20th . 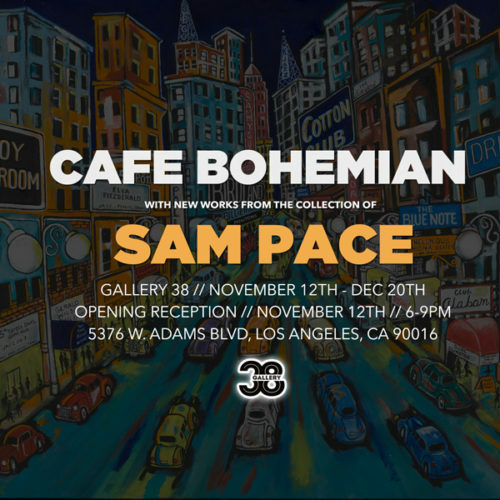 Gallery 38 is located at 5376 W. Adams Blvd, Los Angeles CA, 90016. Gallery Hours: Wednesday – Saturday 2- 6pm. Phone: 213-290-1440.